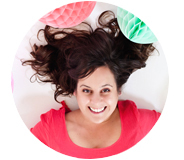 Lucky for me I have great friends like Jesy Almaguer and we have been chatting about all our hair dreams! 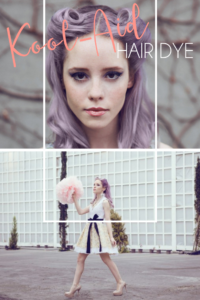 Her portfolio holds some of the most whimsical ideas which are full of inspiration for my kool-aid hair dreams. She and a handful of talented stylists have given up their secrets for a few festive spring hairstyles that bring a punch of awesome to your fashion this spring. 1) You must start with clean hair. To ensure the best hold, wash with shampoo, then baking soda, and rinse well. 2) The formula for easy temporary hair dye is to mix one packet of unsweetened Kool-Aid with, 1/4 cup hair conditioner and 1 tablespoon white vinegar To get this pretty color purple – mix 1/3 cup hair conditioner with 1 packet of blue, with half a packet red and 1 tablespoon yellow Kool-Aid, and a little more than 1 tablespoon white vinegar. 3) Cover entire head and let sit in hair for 60 minutes. Wrap hair up in a plastic bag and clip to save your clothes from being dyed as well. 4) Rinse well and style. A few big curls on top will give this dyed look just enough formality to make you party ready this spring. This tutorial seems perfect for the upcoming week of egg dying and pastel wearing. Instead of dipping an egg – why not dip your hair!?! I am a complete scaredy cat when it comes to hair dye, but this purple – I might really be able to get into. It is fun, festive, and TEMPORARY! Perfect for next months big birthday party. Photography & Art Direction by Jesy Almaguer, see more photos from this beautiful shoot right here. Styling by Tere Prieto. Model: Marijose García. And what if I want pink hair?! Love love love this! So going to try! Great idea, this looks so amazing! This look is so fun. And the photoshoot is just pretty. Ally, I’ve heard it mostly washes out the first time you wash it, and completely in about 3 washes. Will this work for dark hair, or only on blondes? Cris hi! All colors will work on light hair. The colors that take better to dark hair are – purple, red, and green. Just like actual dying, it is difficult to go lighter without bleach (and please don’t bleach at home;). Let me know if you try it, I’d love to see. What about the color in the pictures for dark hair? Will it work as well? I want to try this soo bad, but my hair is already colored. Would it work on previously highlighted hair? My highlights are a light, carmel blonde and i would hate if it messed with the color permenately. I know it says its temporary, but do you know if it would affect my highlights? I have bleached blonde hair so this would work perfectly for me, but I have a few questions. Will this not bleed onto my clothing and bedding? Also will it not make me smell like kool-aid? Presumably adding the conditioner softens its effects, but as a teenager with dark hair who didn’t want to bleach to use Manic Panic, etc. Kool Aid was my go-to. Because it would stick to my brown hair. And stick. And stick. I’d be a bit wary. Did you use this recipe or another one when you did kool-aid? And if you used a different one, what was it? Love the hair color, but I am more interested in what she is wearing. Especially in the first photo. The florals look lovely. Would this work on darker hair or does it have to be bleached? Wow, I absolutely adore this look! I have dark brown hair, so I was wondering if I can still achieve this pastel purple color. Should this have turned into a brown paste? After adding all the ingredients together, it turned brown rather than purple. Is that the correct color for putting on my hair, or should I just stick with buying grape Kool-aid and dying it that way to get light purple? I would be wary and do a strand test first if the henna has metallic components. The vinegar might react to the micrometals in the hair strands and give an odd outcome or even cook the hair. Alternatively you might be able to use just the hair conditioner and Kool Aide. Again do a strand test first somewhere where it won’t be as noticeable and see what kind of results you get. the color looks great! I would like to try this! Which flavours of kool aid did you use? I am a stylist. Fare warning…if you have previously colored your hair (lighter and especially blond hilites) this will stain your hair and it will be a nightmare to get out. I have seen this last well over 6 months. Although that was with red/pink and they stain worse than other colors. The shade of purple you achieved is beautiful though. Hi. This tutorial is lovely and I’m quite eager to try this but I live in Australia and we don’t have Kool-Aid here. Can you suggest any alternatives? Could I use this to dye my ends? I would say you could but you might have to wrap the ends in plastic wrap (Saran wrap, Glad wrap, etc) and hit it with a hair dryer on low for a while (or sitting out in the sun so the sun can warm it). The wrapping up your head in the original process allows the plastic to trap in the heat from your head and processes the color into the hair strands. Might take some trial and error experiments to get the timing down to where the hair strands hold the color properly. Hey, I’ve followed the directions and didn’t put anything else in it, but it burned like hell 3 min after putting the mixture on. Could you know why? You might not have gotten all the baking soda out of your hair prior to applying the mixture. The baking soda will react to the vinegar and produce heat (and irritation!) Remember the volcanoes you made in elementary school where you poured vinegar into the hole with the baking soda and it foamed up and spewed out? Be careful with this. My sister has very light blonde hair, and mom used red on her hair for dress up…yeah, she had red to pink to light pink….it lasted about a month. I’d be careful if you have gray hair, too. Gray hair reacts like blonde and the color could stay for quite a while. 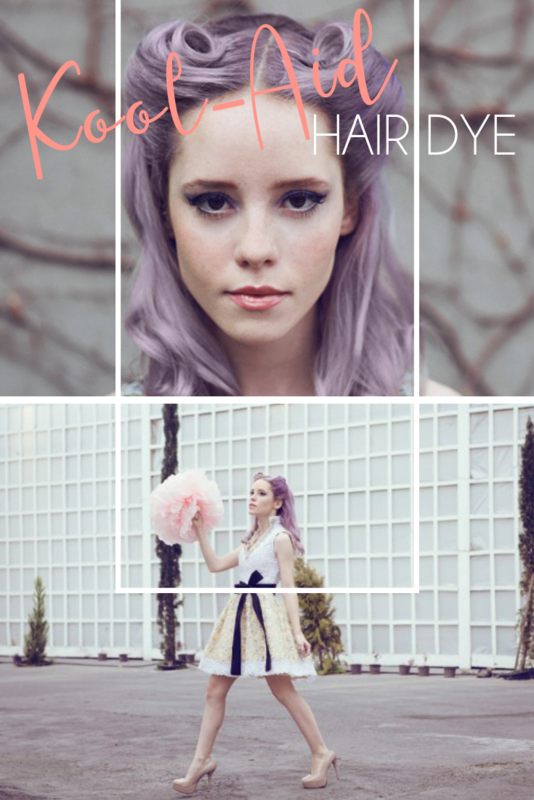 I just tried this recipe for the lilac color exactly as it says, my hair is naturally blonde and it turned a greenish color. Im from the UK can you tell me what kool-aid is?.. Kool Aide is the name brand of drink mix powder. It comes in all kinds of flavors like grape and blue raspberry and lemonade, etc… It’s a little powder packet that you mix with water and sugar to make a fruity flavored kid’s drink. I couldn’t find a UK equivalent right off the bat but I did see where you can buy it off Amazon UK and some folks said they were able to find it in some grocery stores there. I would suggest the Amazon route simply because I’m not familiar with what the equivalent would be there. We have many ‘generic’ versions of Kool Aide here as well. ‘Kool Aide’ itself is a name brand for the flavored drink mix. What color was your hair before you dyed it? Can we do this with other colors of koolaid? Will this work on light brown hair? May i know. Where is Kool Aid Hair Dye is available? I am from Philippines. I love to. But it is difficult for me to find it. So, will you help me. I can’t wait to try this! 1 question, do you use the conditioner and kool aid mix on wet hair or dry hair? I know it needs to be clean but can you do it right after you wash it? Thanks! Sorry to be so late to the party but how light / dark was Marijose’s hair before dyeing? How light does my hair have to be because it’s some where between blind and brown. Sei sempre favolosa e regali ogni volta nuove idee per il proprio look. Mi ispiro moltissimo a te e ti porto sempre come esempio alle donne che vogliono migliorare il proprio aspetto partecipando ai miei corsi di consulenza d’immagine. This doesn’t work. I did it with tons of baking soda and mixed it with shampoo then washed my hair. I mixed two packets of unsweetened cherry hello with 1/4 cup of conditioner then put about 3 tbsp of vinegar because the jello was too clumpy to stay on my hair. I don’t know..maybe I put too much vinegar or I needed to boil the jello first..